The prized Balsamico Tradizionale is very much like a fine wine. The region of Emilia-Romagna in central Italy, and the towns of Modena and Reggio are the most notable production areas. It is generally produced from Trebbiano grapes. Custom demands that the grapes are harvested as late as possible to take advantage of the warmth that nature provides. These white wine grapes are crushed and pressed into a juice, called "must", and then simmered in open pots for 24-30 hours. This unfermented juice is cooled, allowed to settle, and then placed in the first of a series of barrels to mature. The barrel is filled only 65-75% capacity so further evaporation and condensation occurs. The must goes through alcoholic fermentation that turns the sugar into alcohol and then acetic oxidation turns the alcohol into an acid that transforms the liquid into vinegar. have an acetaia, an attic room devoted to storing the vinegar barrels. At least 12 years of aging are required by law to make genuine aceto balsamico. Even 20-30 years of aging is not uncommon in Modena and only the finest specimens are permitted to be called aceto balsamico tradizionale di Modena. Production is governed by a quasi-governmental Consortium of Producers of the Traditional Balsamic Vinegar of Modena. Products under their supervision come with an official seal ensuring that they have met stringent standards in a blind tasting by experts. The color is dark brown, but full of warm light. The fragrance distinct, complex, sharp, and unmistakably but pleasantly acidic. The flavor is traditional; sweet and sour in perfect proportion. Modena's aceto balsamico dates back at least to the 11th century, when a written record reports the delivery of a barrel of the extraordinary vinegar to Emperor Henry III as a coronation gift. For centuries, the aceto was made by local families only for their own use, with the barrels often a prized inclusion in a young woman's dowry. At one time it was believed that balsamic vinegar could alleviate some of the pain of childbirth, so small amounts were given to expectant mother during delivery. Obviously, the production of aceto balsamico is a time intensive process and therefore these vinegars can be quite expensive. Also, the yield is approximately 30 gallons of balsamic vinegar from 800 gallons of grape must. These artisan-made vinegars are meant to be drizzled over foods such as fresh strawberries or Parmigiano-Reggiano, or used sparingly as a condiment. The very finest are sometimes sipped as a cordial. For cooking purposes, the less expensive commercially made balsamic vinegar will suffice. It will add a pleasant sweet-tart lift to sauces and soups and a lovely brown glaze to meats and poultry. 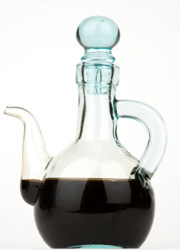 The vast majority of balsamic vinegars available in the U.S. are commercial vinegars. They are not subject to the same restrictions as traditional balsamic vinegar. There is no rule regarding how long the product should be aged and no restriction on the material from which the storage vats are to be made. Therefore it constitutes a more economical alternative to the traditional product. Some of these have wine vinegar or caramel added to enhance the taste. Others basically follow the traditional method but shorten the aging time. These vinegars marketed for every day use are sometimes called "condimenti." The most popular type, usually labeled "aceto balsamico di Modena," is generally a blend of cooked grape must and wine vinegar and tend to be more acidic. Your best guide will be your own taste and budget, If you can indulge in a fine tradizionale to use sparingly, it is wonderful to have on hand for special presentations. 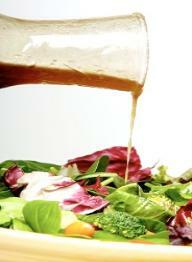 For every day use, a good quality, commercially made balsamic vinegar can impart excellent flavor.